Famous people born on JULY 2 can be compliant or dictating. As a Cancer celebrity born today they tend to keep a lot of things to themselves. With that being said, they use their alone time to imagine or to comes to terms with themselves. It natural for the July 2nd famous celebrities to be disgusted by the thought of physical abuse to other humans as they reflect on life. They are extremely concerned about other people and their well-being. For this reason, they get love back. As a downfall, famous celebrities born on July 2 tend to fall in love too soon and well, they suffer much heartache behind it. They look for a long term possibility as emotional security is important to them. Although they can be moody individuals, they don’t hold a grudge for long. As a career, they could be happy in the legal profession. This will give them the opportunity to save a few lives that want to be saved. 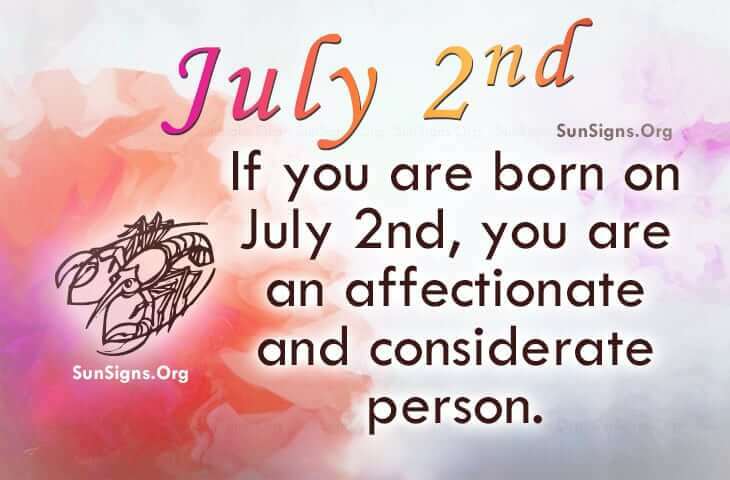 Famous people with a birthday on July 2nd, are possibly the most affectionate and considerate people. Typically, a friendship with this famous individual will have long-term results if it is one that is loyal and harmonious. They will make a protective parent and partner.